Having thoroughly enjoyed the Bai Long Store breakfast menu early this year I have been longing to return. Some new menu items were the perfect excuse, so we headed back to the yin and yang inspired restaurant for another marvelous feast. The understated dining room is cosy at night, the minimalist décor and simple elegance enhanced by dim lighting and subtle background music. While waiting for out meal we tried out some of the innovative creations on the cocktail menu. Asian inspired as expected, centering around Japanese spirits and tea. We loved the bling in their Old Fashioned; truffled scotch, gaba tea syrup built over gold powder that gives an iridescent glow and a pizazz. Its smooth on the palate but has the requisite alcohol content of the classic cocktail. For those who don’t enjoy their liquor quite as hard the Long Highball; Suntori whiskey (Japanese) with green apple juice and mango will suit your taste. Tempted by the Sparkling Negroni; it has all the ingredients of a classic Negroni diluted down with sparkling tea – a Negroni for those not quite qualified for the real thing. 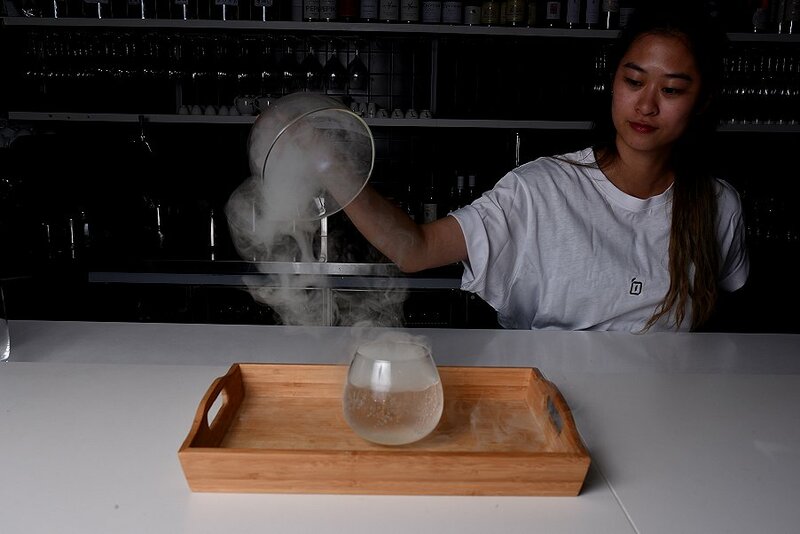 Lovers of Laphroaig must try the Dragons Breath; a mix of gin and rambutan gastrique is smoked with sage and served in a cloud. A show of creativity in every glass, the Bai Long mixologist is pushing contemporary boundaries with class and restraint. Finally time for some food and we adore the San Choi Bao with Sichuan lamb shoulder. 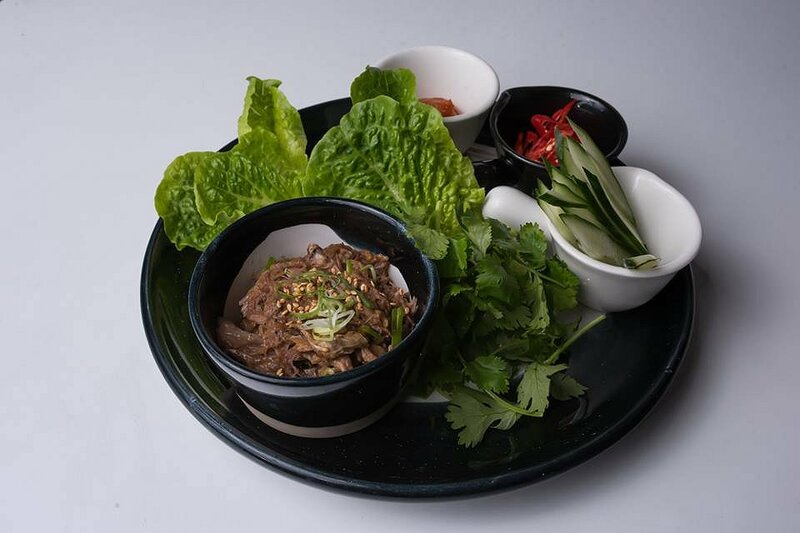 Don’t be deterred by the bright orange colour of the ssamjang sauce – it’s not overly hot so make your San Choi Bao with a little sauce, cucumber and chilli on your cos cup and then heap on the luscious shredded lamb. The buttery soft meat is the yin, off set by the crunch of the crisp lettuce and cucumber, the yang of the dish. A beautiful example of this classic entrée and the lamb is just dreamy. 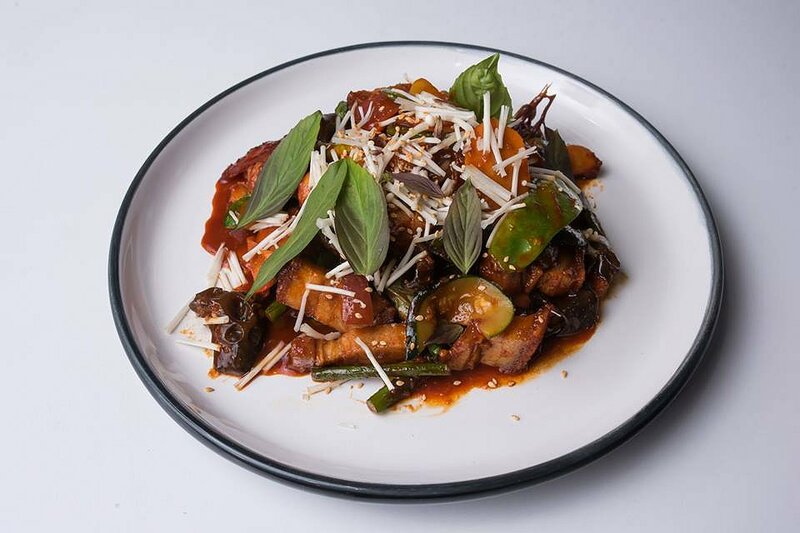 A different take on pork belly, the cubed Wok Belly is stir-fried in a spicy chilli sauce with garlic shoots, green bean and black fungus. 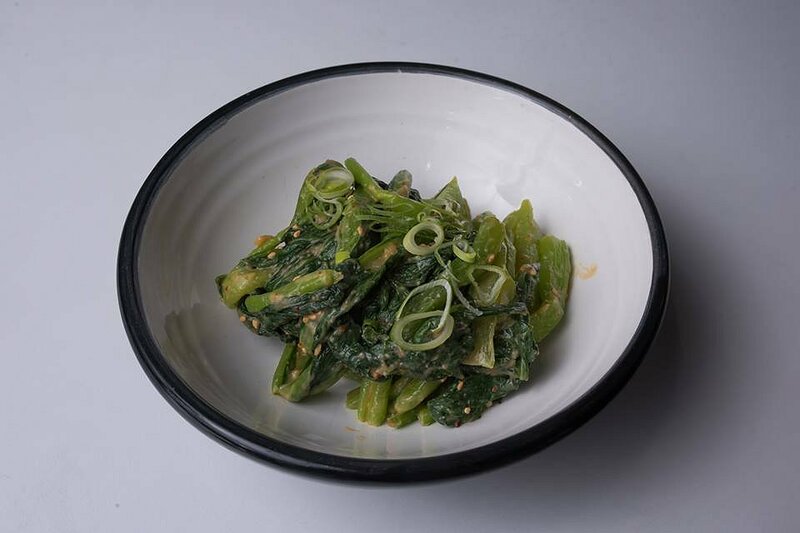 Strong Korean flavours dominate this dish, spicy and clean with an ever-present ferment tang from kimchi. We move onto the Crispy Noodle with minced pork, garlic, ginger and charcoal noodle. A rustic, homestyle dish to me it resembles an Asian style cottage pie. 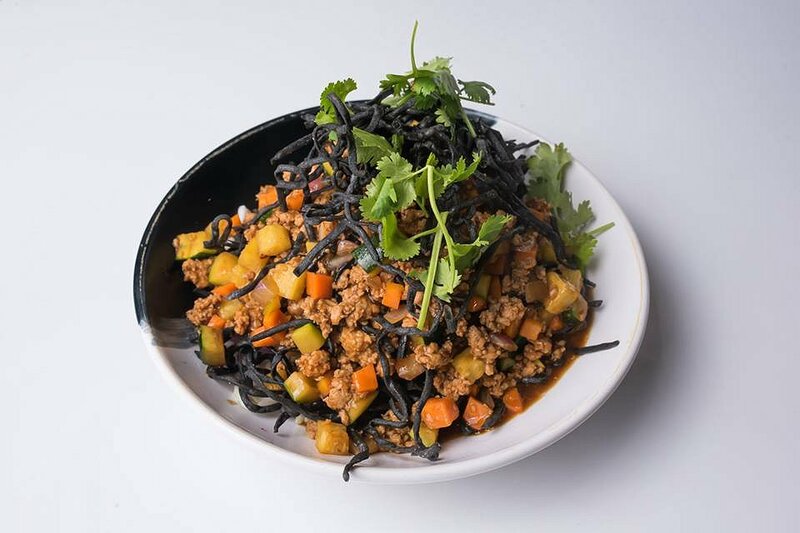 With cubes of vegetables and subtle flavours with moist mince and piles of Bai Long’s signature charcoal noodle that are available for purchase at the store. Again Bai Long surprises me with their treatment of tofu in the side of Roasted Cauliflower. The smashed tofu forms the base of the dish with a strong sesame flavor. 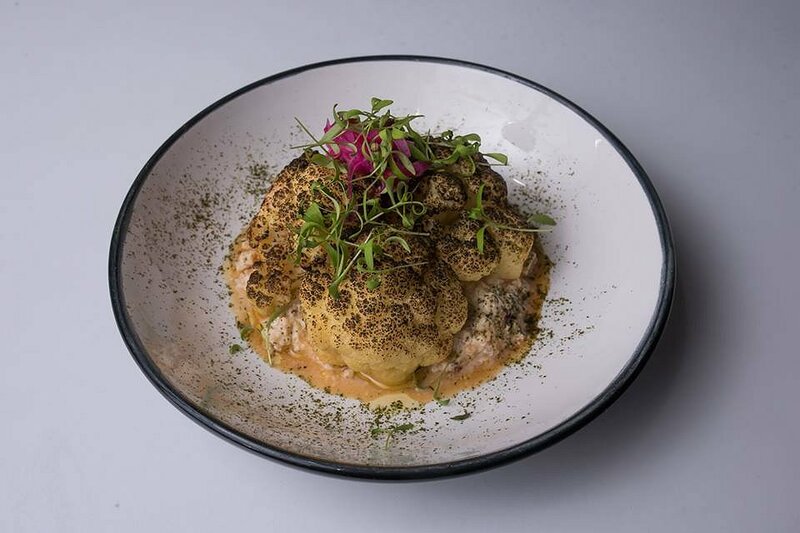 Generous cauliflower segments have been blackened to produce a delightful char flavor. Pickled onions provide a contrasting acidity and nori dust adds saltiness. The side of Chinese Greens worked perfectly with every dish. Vibrant green the stems remained crisp with the leaves perfectly wilted. Flavours of sesame and satay danced over the bitter leaves. Despite being served cold they were moreish and satisfying. I would suggest ordering this with any meal. Time to get serious and talk about the Kimchi Chips. They are sensational. Resembling an Asian inspired bowl of wedges the skins on the kiphler potatoes are perfectly crisp. 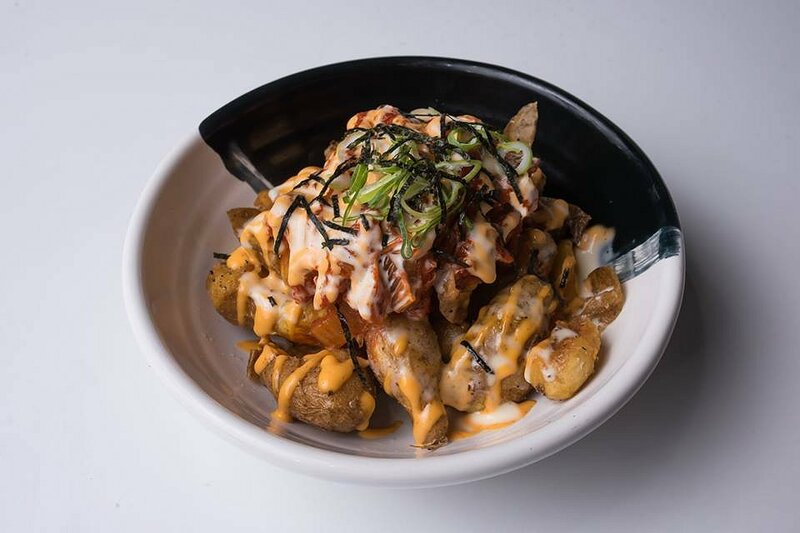 Topped with kimchi and spicy mayo I simply cannot get enough and I’d be quite happy with a couple of cocktails and a bowl of these potatoes. Now desserts at Asian restaurants get a hard rap and I hate to say, deservedly so. 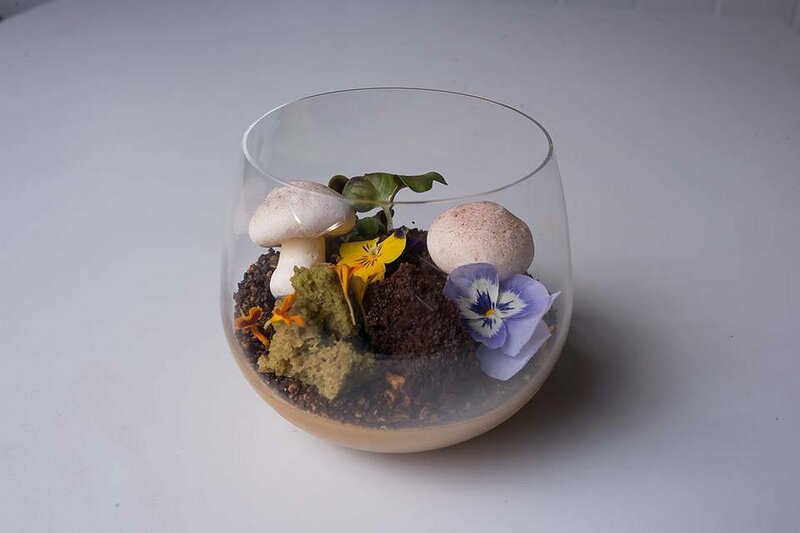 Bai Long is leading the way with their artful, inspired and downright terrific desserts. There is an element of a typical Asian flavour or two in each dessert but these five star desserts could be served in the best fine dining restaurants. We start with the new menu item Mini Garden. After spending too much time admiring it and not wanting to disturb its beauty I dug through the chocolate soil to the coffee mousse. The mousse tastes just like an iced Vietnamese coffee, complete with condensed milk and it perfectly complements the bitterness in the dark chocolate soil. Every few bites present with a tangy passionfruit curd and a peanut praline adds a sublime caramel crunch. The Mandarin Bingsu is refreshing, tangy and lively. 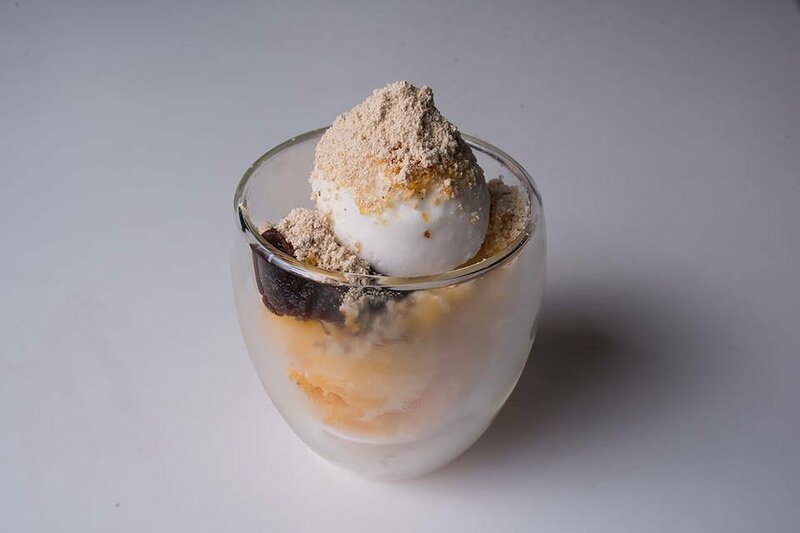 The yang of punchy, citrusy mandarin granita juxtaposed with the roasted coconut ice-cream yin. In an intriguing twist a power of grains and red bean puree add an earthy, natural element. Curious and interesting but delicious in every way. The philosophy of Bail Long is reinforced in every dish. Yin and Yang create balance; crispy fried noodles with cooked saucy noodles, citrus paired with earthy flavours, crispy with soft, sweet with sour and hot with cold. In doing this not only is the menu balanced but it flows to each dish, each drink and the entire dining experience. Dining at Bail Long is not just about the food. Although you will leave feeling satiated, refreshed and nourished the experience unlocks a sense of calm, peace and order. I can’t wait to go back.